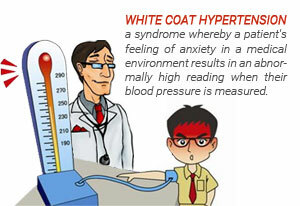 White coat hypertension is the term used for when some individuals show high blood pressure readings in the Doctors surgery but their blood pressure returns to normal at home. The issue is that their Doctor may have diagnosed them incorrectly as hypertensive and possibly prescribed an anti-hypertensive medicine. The research was conducted at Barcelona University proved that 34% of men and 42% of women have what is known as white coat hypertension. They assessed over 69.000 people with high blood pressure over 24 hours, they also had them take their own blood pressure readings at home. It was discovered that only 63% of those tested had true hypertension, measured as 140/90. Most of them were either smokers, diabetics or had some form of heart problem. All the more reason why you should buy a clinically approved home blood pressure monitor.